You will have no trouble finding a snug spot on Villa Skyfall‘s spacious pool deck to cuddle and cosy up. The sun loungers are a good bet, and so are the plump couches and pillowy daybed. 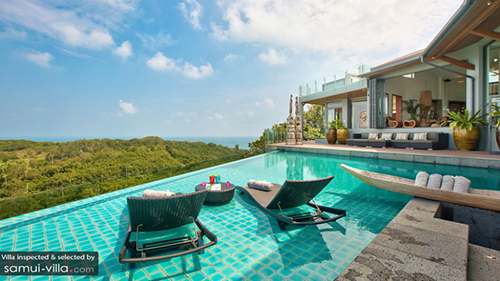 Overlooking a vast expanse of tropical greenery and Choeng Mon’s rugged coastline, there is a high chance that holidaymakers lounging at the pool deck will want to keep their gaze on this scenic view all day. We recommend arming yourselves with plenty of cocktails and iced drinks, and take dips in the sparkling infinity pool to cool down from the heat. 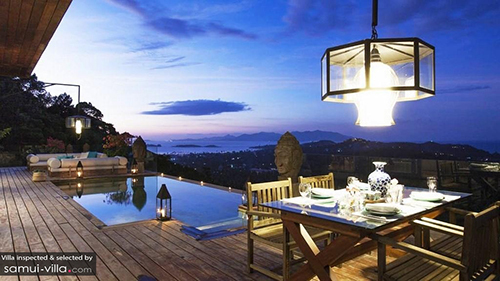 Lounging upon the pool deck of Villa Belle is a sweet affair. Pillowy white couches, turquoise cushions, pretty pool lights and oriental ornaments adorn the pool deck. Start the day with a morning coffee by the poolside. 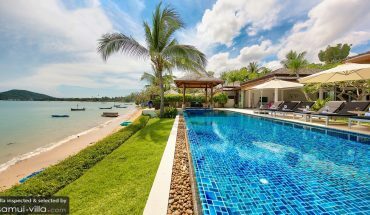 Next, you will want to spend your hours lounging upon the comfy seats of the couch, or cooling off from the tropical heat by taking a dip in the refreshing waters of the infinity pool. When the evening beckons, enjoy a round of sundowners while you catch the sunset from your private pool deck. 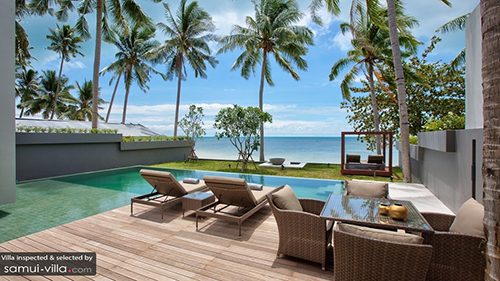 Nestled away in the hillside area of northeast Samui, Villa Sip Et (A) offers a tranquil environment ideal for a restful couple retreat. 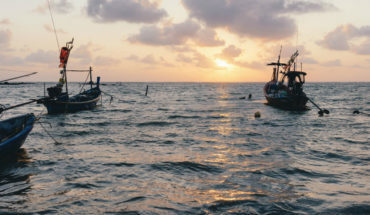 Here, you will wake up to stunning panoramas of Samui’s rugged coastlines, emerald greenery and sparkling ocean. There are a variety of snug spots to take in the lush scenery, but our favourite place to sit back, unwind and relax is at the charming pool deck. Pack in tons of sunblock lotion and sunglasses before making our way to Villa Soong, for you will not be able to resist spending plenty of time outdoors under the tropical sun here. A well-landscaped garden is ideal for enjoying strolls and picnics, while the picture-perfect pool area that serves as a great hangout spot for lazy brunches, leisurely sunbathing sessions and evening sundowners. While relaxing outdoors, let your gaze rest on the pristine beachfront beyond the villa. 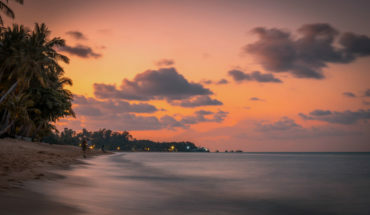 When the urge to frolic along the coast hits, a few quick footsteps is all that it takes to arrive at the sandy shores of the beach. 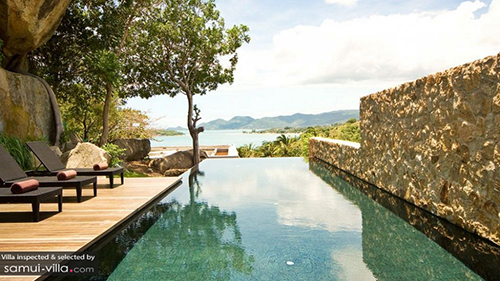 Bacaya Villa was built for vacation makers with a love for Samui’s sun, sand and seas. 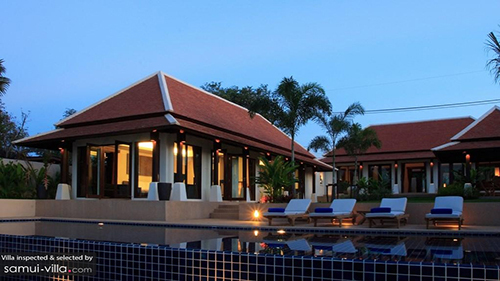 Set along the sweeping coasts of Bo Phut, the villa offers a spectacular vista that encomprises the rugged coastline of Koh Phangan, as well as the striking structure of the renowned Big Buddha. Sumberge yourself into the infinity pool at the villa, cast your gaze out onto the ocean, and you will feel at one with the boundless sea.